An outdated bath needed a head-to-toe redesign, and The Design Source was just the firm to update this luxurious space. Top priority to the homeowners was removing an expansive built-in tub and tub surround along with large columns. 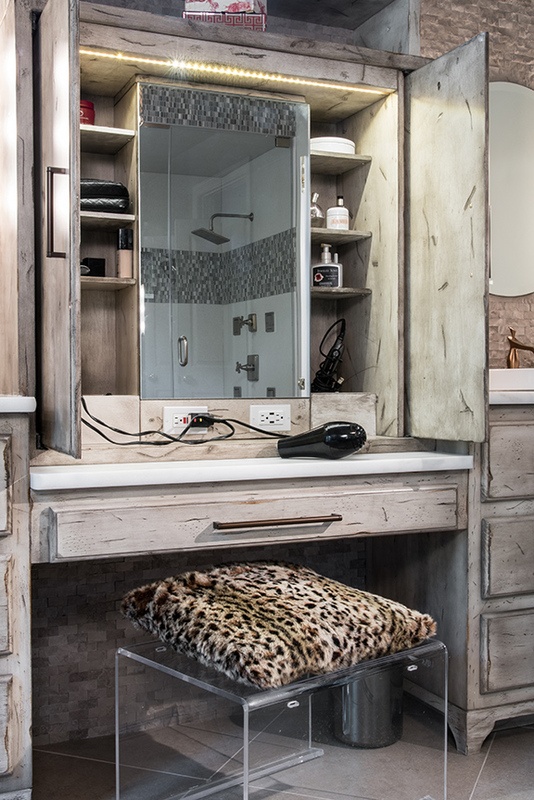 Adding an oversized steam shower, freestanding tub and double vanity with a highly functional custom makeup vanity and stunning glass-door cabinets complete the transformation. The custom cabinetry is totally tricked out with practical and impressive storage inside. 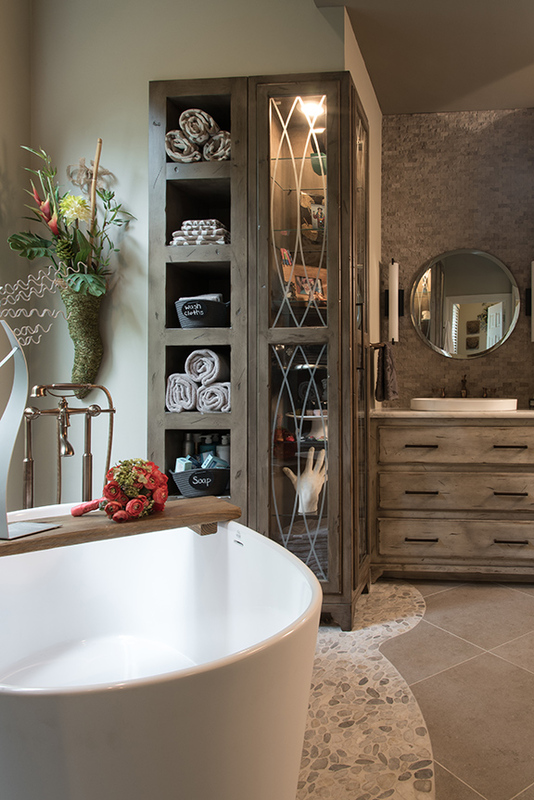 In the glass cabinets flanking the freestanding tub, the client displays one-of-a-kind treasures. Designed to frame the lemon-slice window, the cabinetry creates a design detail that was once outdated in the original bath. Honed marble counters, porcelain vessel sinks and brushed bronze plumbing finishes complement the existing ceiling fixture while adding a chic flair to the space. 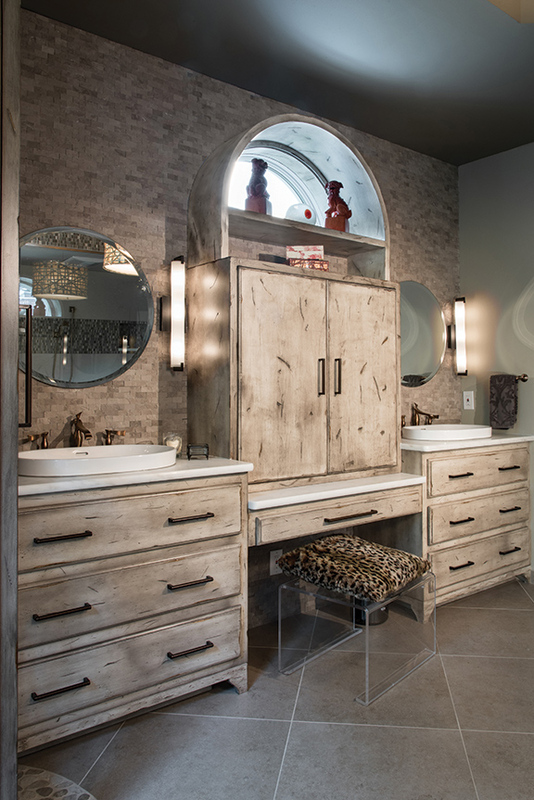 This bath is a little bohemian with touches of contemporary panache set free by custom cabinetry that is so gorgeous it defies description. This doesn’t feel like a bathroom. It has such style. The storage cabinet is heaven! The bath has a custom feel, and the floorplan is fantastic.